Brunei has a unique economy which combines a mixture of local and foreign investment and government regulation. It is one of the richest countries in the world because of its small population and reserves of oil and gas. The country enjoys one of the highest per capita GDPs (US$41,130 in 2008-12) in Asia benefiting from high export earnings and foreign investment. Its GDP growth is 0.6% per annum (2008-12). 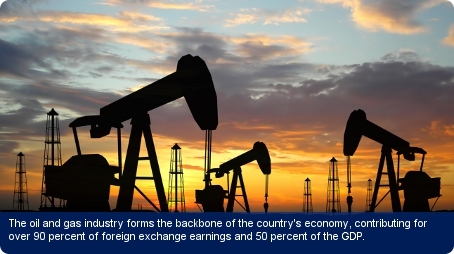 Crude oil and gas form the basis of the country’s economy, accounting for over 90% of foreign exchange earnings and 50% of GDP. There are around 1.1 billion barrels of proven oil reserves and 390 million cubic metres of proven natural gas reserves in Brunei (2011). However, the extent of Brunei’s industrial base remains limited when the oil and gas sector is excluded. In the early 2000s the economy benefited from high global energy prices, with little inflation, but suffered in 2008-09 due to the global downturn. The volatile oil prices leave Brunei’s economy vulnerable to global economic trends. The infrastructure within Brunei is well developed. Three quarters of the country’s roads are paved and there is a deep-water port at Muara, with a dedicated container terminal. The Brunei International Airport is 6 km north-east of the capital, Bandar Seri Begawan, and is served by AirAsia, Malaysia Airlines and Singapore Airlines. Brunei is placed roughly in the middle of East Asian countries on the World Bank’s ‘Doing Business 2012’ study, but placed 20th in the world for paying taxes. These rankings measure the conduciveness of a regulatory regime in starting and operating a business. The government employs around 60% of the workforce, while foreign workers make up about one-third of the total work force. Malay is the official language, though English is widely used as a business and working language and is also the language of instruction in secondary and tertiary education. The government is focused on upgrading the skills of its workforce and diversifying Brunei’s economy by encouraging investment in manufacturing, banking and tourism.